Chemical analysts have been shocked to find that ‘pre-historic’ cave paintings found in an underground cavern in Spain in 1990 are a fraud. The cave-explorer who ‘discovered’ the paintings at Alava in northern Spain was honored at the time as a hero. He was awarded 10 million pesetas (about $130,000). Archaeologists had said the discovery would revolutionize ideas about prehistoric art. Animals depicted included an extinct rhinoceros—the first of its type seen in Europe. But specialists who were called in to analyse the paintings were shocked to find that the paint contained chemicals that had been applied within only the past five years. This embarrassment to archaeologists shows the danger of dating paintings or artefacts based only on style. The finding of ‘primitive’ art work or tools does not mean they be-longed to the Stone Age. Diggings, September 1992 (p. 15). A fossilized egg of a dinosaur from Aix-en-Provence in southern France was put up for auction in London in July. The egg sold for £5,500 (about $12,000). The egg, from a Hypselosaurus, is 18 centimetres (seven inches) long and 15 centimetres (six inches) wide. New Scientist, July 11, 1992 (p. 8). <Some people have puzzled over how a female dinosaur weighing perhaps 30 or 40 tonnes could lay a clutch of eggs without crushing them. Interestingly, Hypselosaurus eggs have been found in both France and the United States, and in both areas the eggs seemed to have been laid in batches of two in straight lines. The mother dinosaur apparently laid them while moving, which avoided the inevitable crushing if clutches had been laid in a single nest. Has the legendary Loch Ness monster been detected lurking in the loch’s chilly waters? The object was detected between Foyers and Invermoriston. It registered on the equipment’s red-section—the strongest part of the sonar system’s scale. Daily Express, August 3, 1992. The humble one-celled organism, brewer’s yeast, is the first to have the entire DNA sequence on one of its chromosomes decoded. To find out the ‘spelling’ of the chemical information on this tiny chromosome took the combined efforts of 35 laboratories in 17 countries! Interestingly, the project revealed that this chromosome contained many more genes (stretches of meaningful information) than had been estimated. It was believed there might be as many as 70—but the final total was 182. This means that humans might contain many more than the 100,000 genes now estimated to exist. The West Australian, August 10, 1992 (p. 11). What do isolated Australian Aborigines have in common with the isolated Amish religious community of Pennsylvania in the United States? Doctors at Western Australia’s Princess Margaret Hospital in Perth believe the groups have the highest and second highest incidence in the world of a rare genetic disorder. It causes babies to be born with extra fingers and toes. The Amish community, which shuns modern living, has been regarded for some time as having the highest number of cases of the disorder—known as the Ellis–van Creveld syndrome. Results of a study on Aborigines with the disorder have led the doctors to suggest that the local Aboriginal community may have the second highest frequency. The doctors believe the genetic disorder can be traced back in both groups to a Dutch connection. The Aborigines had contact with eighteenth century Dutch traders, and the Amish were Mennonites who migrated from the Netherlands to the US in 1683 to escape persecution in Europe. The West Australian, August 17, 1992 (p. 9). Extra fingers and toes are not evidence of evolution. The originally created ‘digit’ information for humans has been duplicated by a genetic mistake. No new, useful information has arisen. Toys, games and books which present cavemen living with dinosaurs are annoying evolutionist fossil experts. So much so that a group of eminent US palaeontologists has formed the Dinosaur Society to give the evolutionary view more prominence. Television programs such as Dinosaurs and The Flintstones, and films like One Million Years BC, which show humans and dinosaurs together, are particularly annoying to the group. Dr Ken McNamara, from the Western Australian Museum, said young audiences often had wrong ideas about dinosaurs. He said mammals were around at the time of the dinosaurs but they were tiny shrew-like animals. He said many scientists say dinosaurs are still around today, ‘flapping around in the trees’, because birds evolved from meat-eating dinosaurs. The West Australian, September 7, 1992 (p. 9). Birds, humans and animals (including dinosaurs) were all created around the same time, according to the book of Genesis. There is no indisputable evidence to show otherwise. Black rats in Israel which have invaded a new habitat have substantially changed their way of life. They now live more like squirrels than rats. They build their nests and spend most of their time in trees in young forests of Jerusalem pine. Here they subsist, free of competition, entirely on the seeds of the pine cones, the only food available there. Seeds from open cones quickly blow away, so the rats have devised a way of getting seeds out of the intact cones. This is a complicated task, involving stripping off the hard scales by following them in their spiral pattern around the shaft. Research has shown that rats taught by their mother quickly learnt the tricky task of opening the cones, but those ‘naive’ rats reared with out such input failed to work it out, ‘even after three months of trying’. New Scientist, September 19, 1992 (p. 17). In spite of this drastic change in behaviour, there is no new genetic information coding for new instincts. The behaviour change is not passed on through the genes (DNA); the capacity for such learning was already present in these rats. It thus tells us nothing about any assumed biological evolutionary processes. Similarly, human populations are not evolving more intelligence, just learning more. Alternatives are therefore bound to raise interest. At a recent major workshop, fossil fragments from China were presented as being from a new type of chipmunk-size ‘anthropoids’. If they were indeed anthropoids, then their assigned evolutionary ‘age’ (45 million years) would have made them evolutionary ancestor candidates. Not everyone at this conference was convinced. One said, ‘I just wish you’d tell me what’s anthropoid about this thing’. Renowned evolutionist Philip Gingerich, speaking for the minority, said, ‘I think these things arc hedgehogs, broadly speaking’. 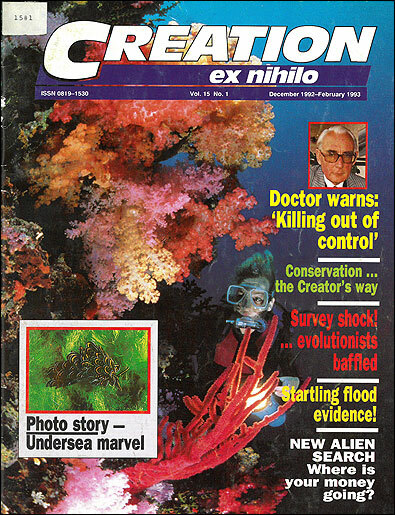 Science, Vol 256, June 12, 1992 (pp. 1516–1517). A dinosaur fossil found in Montana, USA, has been claimed to be an evolutionary ‘missing link’ between Tyrannosaurus and a similar dinosaur called Daspletosaurus. Dr John Homer, from the Museum of the Rockies in Bozeman, Montana, and his colleagues, say the fossil is evidence that there were rapid bursts of dinosaur evolution. Billings Gazette, July 4, 1992 (p. 1-C). New Zealand Herald, July 8, 1992. It must be kept in mind that Tyrannosaurus and Daspletosaurus were very similar. Their skulls were little different except in size and number of teeth. Anything ‘in between’ would thus seem to qualify more as evidence for variation within a kind, and certainly doesn’t indicate that dinosaurs evolved from non-dinosaurs. The latest country to join the quest to find life in outer space has failed at its first attempt. Australian astronomers have now followed in the tradition world-wide of not finding any radio signals from extra-terrestrial intelligence. Leader of the Australian team trying to detect life elsewhere in our galaxy is Professor David Blair, from the University of Western Australia. Professor Blair and his team are collaborating with the American program SETI (Search for Extra-Terrestrial Intelligence) for the southern hemisphere part of the 10-year Project Columbus began in October. The basic hypothesis of the program is that civilizations are rife throughout our galaxy. ‘All we have to do is find the right frequency to tune in to’, Professor Blair said. The American program is funded with US$100 million from NASA. The Sydney Morning Herald, August 23, 1992 (p. 46). Many think that if life could evolve on earth it could also evolve elsewhere. But first they have to prove it evolved on earth—which they haven’t. Think what research could be done if creationists had research funding of $100 million!